Yes, I have something for you today. And you are going to want to thank me. Welcome to the world of sourdough crepes. It's a world you may have been missing. It's a world you need. It's a better world, a happier world, a wonderful world. Ok, ok, I jest. But sourdough crepes really are excellent. 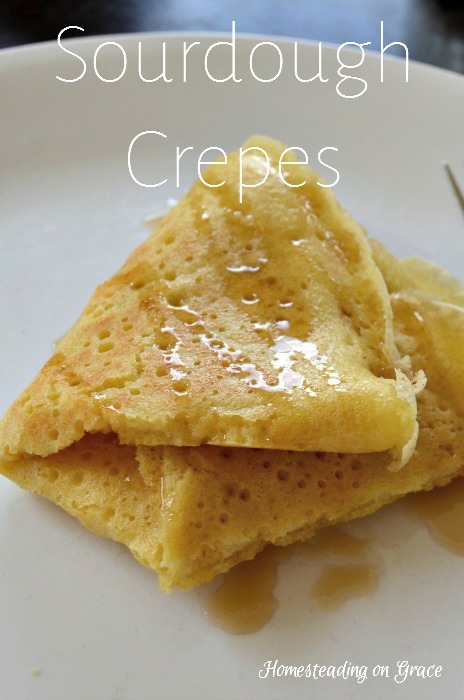 And easy, even though they have the fancy-pants French name "crepes." And even though it seems like a special sweet, they really don't have sugar in them, so it all depends on your toppings. 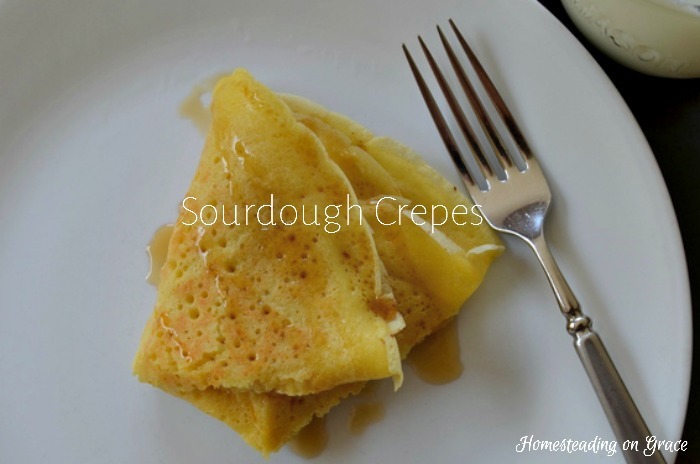 Crepes are a thin, egg-y cross between a tortilla and a pancake. They are delicious topped with any number of things. Strawberries, berries, cream cheese, maple syrup, honey, fruits, nuts, well, the possibilities are pretty endless. I'll show you how we've made ours this week, but this is not the only way to love crepes. To mix up sourdough crepes, you'll want about 8 ounces of your sourdough barm. (It's easy to make these up with my starter since I usually feed it 4 ounces of water and 4 ounces of flour to make the 8 ounces to make my quicker bread.) A little more or less is not detrimental. You just have to get the right consistency. I start heating up my cast iron pan on medium heat while I mix up the crepes. I have the sourdough barm measured out, and it really helps to mix up the batter in a large measuring cup . In another bowl mix up three eggs with a fork. Add those to your sourdough. Then about 1/4 teaspoon of salt. Mix it all together. Now, the batter needs to be pretty thin for proper crepe creation. So depending on how wet you keep your barm, you may need to add some milk to get it to the right consistency. It needs to be pretty runny and drippy. To cook the crepe, pour in enough batter to coat the whole bottom of the pan. But don't pour it all in so that it's a thick coating. Pour some in, and swish it around to fill up the pan. This is very difficult to do if you are also trying to take a picture of your efforts. It cooks and sets quickly, so you want to get the batter spread thin as quickly as you pour it. That's the hard part, and it's not too bad, is it? After you get through that, you just wait a bit for the top of the crepe to start looking dry. Then flip it over to cook the top. It's easiest to use a big spatula , and this part also may take some tweaking too. If the whole crepe falls apart, it may be too thin. (Still tastes good, though, so don't throw it out.) Now just let it cook until it's slightly browned on the underside and move it to your plate. And then repeat. This recipe makes about 6-7 crepes. And they do taste the best warm, so I go ahead and serve them up while the next is cooking so it can be eaten. Now it's time to decorate! We did a scoop of cream cheese in the middle, wrapped it up, and drizzled it with maple syrup. But like I said, this is where you can use your imagination. Or your kids' imaginations. Wrap up half a banana and drizzle it with chocolate. Use a little powdered sugar, if you want. Go nuts! I mean, really, sprinkle some nuts on tops. The sourdough crepe world is your oyster. Those are some greedy little fingers that didn't want to let me take a picture before he started eating. So selfish! Crepes don't last very long in this house, barely even long enough for a picture. Thanks Regina! I know you'll love them! I haven't made crepes in years and have never heard of sourdough crepes. These look delicious! Pinning! These look so easy and delicious! Thanks for sharing with us on Thursday Favorite Things. Looks yummy! Thanks for linking to the Homestead Blog Hop this week!